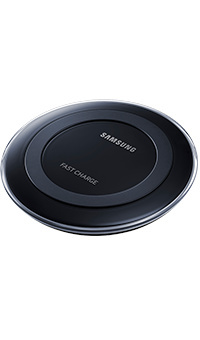 The Samsung Fast Charge Wireless Charging Pad lets you charge your Galaxy S, Note and other selected devices up to 1.4x faster than other wireless chargers. It's quick to set-up, easy to use and perfectly portable. New Fast Charge technology closes the gap between wired and wireless charging. When used with the Fast Charge wall charger (included), you can charge your Galaxy S or Galaxy Note series phone up to 1.4x faster than standard wireless charging pads. The dedicated Charging Pad is small, portable and ready to go as soon as you put your device on the pad, making tangled wires and missing cables a thing of the past. And you can browse the web, use apps and answer calls while charging, all without worrying about having to unplug first. Just connect the Wireless Charging Pad to your phone's charging cable or the Fast Charge wall charger and you're ready to go. The built-in LED indicator light lets you know when your phone is in the right position for a perfect charge.